Most indoor Junior Rock Meetings are held on the same nights as the IFG&MS meetings. These are on the second Monday of the month at 6:15pm at the FairBridge Inn and Suites in the large meeting room by the Bees Knees. Junior members are invited to attend the regular meeting at 7pm as well. Is your family is already a member? ​Then contact the youth leader, or a member of the board, and we’ll get your child set up and their FRA Junior Rock Club badge on the way! Then contact the youth leader or treasurer. Kids need to have an adult participating with them and both must be members. We offer a significant discount to families: $33 for the first year and $28 annually after that. Once we get you on our rosters, we’ll sign your child up for this program and their membership badge on its way! Let us know! We are always looking for volunteers for this program in whatever capacity folks are comfortable. Contact the youth leader or a board member. A Youth Leader - We have a rotating youth leader model for monthly activities but still do need someone - or a couple someones - willing to act as a stable “go-to” person for this program. Interesting Rock Samples - The kids receive a rock sample at each meeting to add to their collections. We aim to keep the sample the same for all kids who attend a meeting, so we need several of any sample provided. Egg Cartons - Preferably 18 count, but any will work. These will be for the kids’ rock collections. General Craft Supplies - Newspaper/tablecloths to line tables with, hot glue and/or hot glue guns, eyes, poofs, little magnets, etc. Whatever you don't need any more, we can make use of. 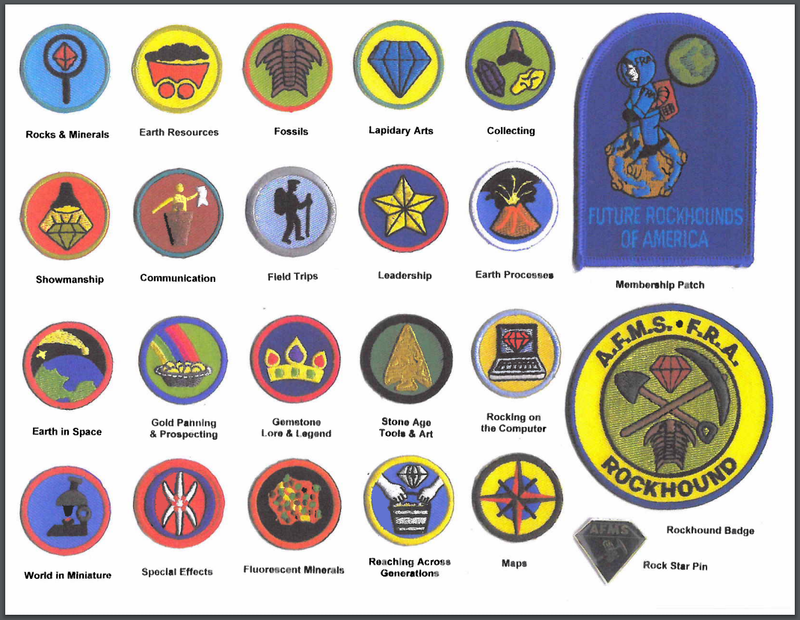 As of October, 2018, our under-18 members can earn badges through the American Federation of Mineralogical Societies’ Junior Rock Program! Junior members work on activities at monthly meetings specially designed for the younger rockhound. For now, until the weather warms back up, we will be meeting at 6:15pm, before our regular monthly meeting (which our juniors are more than welcome to attend! They and their families are full members!!!) the 2nd Monday of each month. There are 20 main badges, which you can see in the picture below, and two progress badges - one for completing 6 badges and another for completing all 20. Join Future Rockhounds of America: The only requirement for kids to obtain FRA membership is to be a member of a regional club with an AFMS affiliation. In addition, there are a variety of websites that offer activities for children and young adults interested in geology and rock hunting. These would also be excellent for teachers as well.